Some Dutch have a serious problem with Germans (I'm not one of them), especially German tourists. And apparently that problem has something to do with Germans digging holes. And I'm not talking about trenches, I'm talking about holes on the beach. To this day I haven't figured out why they do it... I guess for shelter from the wind? For protecting their white sun-longing bodies from burning UV rays? The last few years I spotted a new German tourist trend: tents. And to be honest, every time I see some tourist sitting in one of those little shelters on the beach, not affected by the wind, feet sticking out for a tan, I'm jealous. 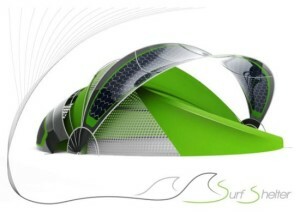 I'm going to make sure I'm the first in this country to get my hands on the Surf Shelter by HJC design. This tent like concept looks great and comes with some great features; a solar roof, a wind generator and an energy output that will let you charge electronic devices.